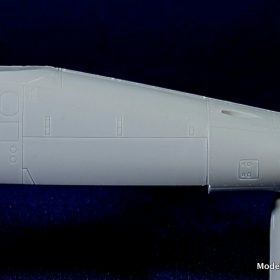 Following the release of multiple 1/48 scale F-5 variants, AFV Club has provided us with a nicely detailed model of one of the more novel and controversial versions of the F-5 to be produced: the Saequeh-80. 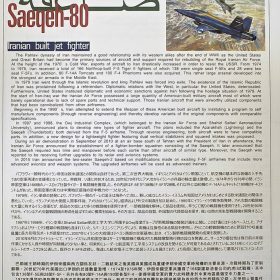 Does the Saequeh-80 represent manufactured copies of the F-5 or are they produced by modification of US-built F-5 airframes? Either way, I did the ole’ Three Stooges double take when I first saw the box art thinking I’d just seen a pigmy F-18!?!?!?!? Once over the shock, the shape of the airframe started to grow on me. I’m a wingnut at heart and it doesn’t take much for me to be smitten with an airplane, especially one within the F-5 lineage. When I saw the tri-colour desert scheme covered by the kits decal sheet, the deal was sealed. 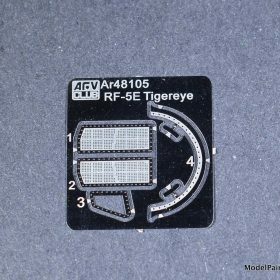 This will be a novel and very aesthetically pleasing model when assembled. 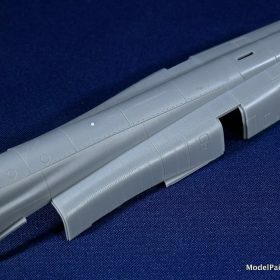 Moreover since AFV Club bases the kit on the previously released Northrop F-5, assembly should be straightforward and details abundant and well done. The HESA Saeqeh-80 (Persian: “Thunderbolt”), alternatively spelt Sa’eqeh, Saegheh, or Saeqeh-80, is an Iranian built single-seat jet fighter, derived from the American Northrop F-5. A joint product of the Islamic Republic of Iran Air Force and the Iranian Ministry of Defense, it is the second generation of the Iranian Azarakhsh fighter successfully tested in September 2007. The first prototype of the jet was shown on state television making a test flight in July 2004. According to the translation by the Washington-based Middle East Media Research Institute (MEMRI) of a broadcast on Islamic Republic of Iran News Network (IRINN), the Saeqeh became operational on September 6, 2006, when it participated in an Iranian military war game exercise called “Blow of Zulfiqar.” In that exercise, which began on August 19, 2006, the new fighter carried out actions described as “a mission to bomb virtual enemy targets” and “a mock bombing mission”. Two prototypes, which appeared to differ from the one that had been shown previously, conducted a fly-past at Tehran’s Mehrabad Airport on September 20th, 2007. Three prototypes took part in a military parade on September 22nd, 2007. Iran has announced that it will test fly the other variants of the Saeqeh in the near future which differ from the previous aircraft due to major changes in weapon systems, aerodynamics, and operational range. Little information on the specifications of the Saeqeh has been released. The Commander of the Islamic Republic of Iran Air Force, Brigadier-General Ahmad Mighani, said that the Saeqeh is up-to-date in terms of aerodynamic balance and in possessing missile and radar systems. The Managing Director of the Aviation Organization of the Ministry of Defense and Logistics of the Armed Forces, Majid Hedayat, described the Saeqeh as a logistic and combat plane with high maneuvering capability and an ability to bomb close targets. The airframe resembles a Northrop F-5 with two vertical stabilizers instead of one. In 2008, Iran announced the Saequeh has a range of 3,000 km (1,864 mi) and the ability to track down enemy aircraft, engage in combat, target locations on the ground, and carry an assortment of weapons and ammunition. During an air show in September 2010, Iran displayed the first squadron of Saeqeh fighter jets during the military parades at the beginning of the Iranian Sacred Defense Week. In May 2012 Defense Minister Ahmad Vahidi stated that three new-generation Saeqeh fighters had been manufactured and delivered to the Air Force. 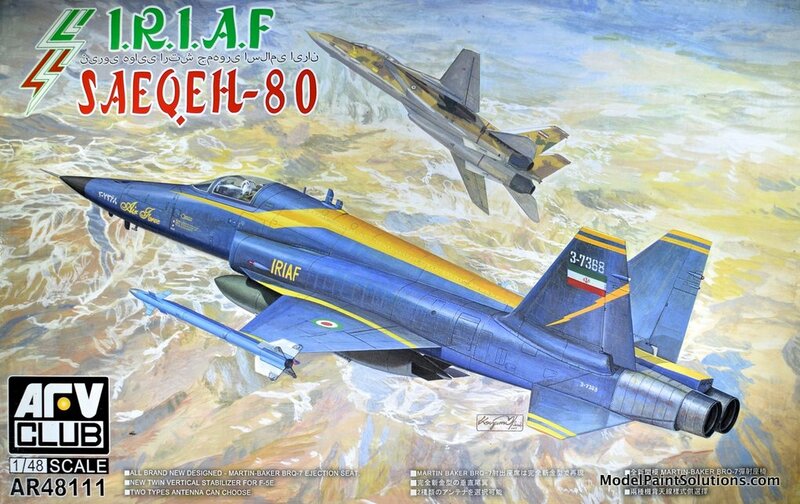 On August 26, 2012 deputy Defense Minister Mohammad Eslami announced that an upgraded version of the Saeqeh would be introduced into the Iranian Air Force by the end of 2013. 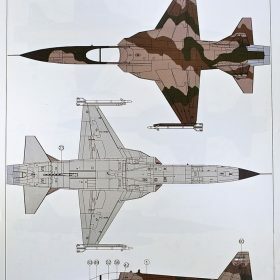 Visual differences between the Saeqeh and the original Northrop F-5E remain limited to two instead of one vertical stabilizers, additional wing strakes, and altered jet intakes. Fuselage, landing gear, engines, weaponry, and cockpit instruments seem identical to the F-5E, indicating that the Saequeh is not a new-built jet fighter, but the result of modifying existing Northrop F-5 airframes. It is also possible that the Saeqeh airframes are actually taken from a large inventory of old F-5s in non-flyable condition. This would explain why the serial numbers for only nine aircraft have been observed thus far. A new version of the Saequeh was introduced in 2015 with 2 seats, more advanced weapon systems, electronics, and avionics. 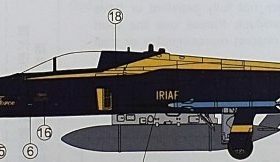 The IRIAF is believed to have 17 Northrop F-5F aircraft remaining in its inventory that may be suitable for conversion to the Saeqeh-2 configuration. Powerplant: 2 × Ivchenko ai-322f afterburning turbojet engines, 24 kN (5,500 lbf) thrust each dry, 44 kN (9,900 lbf) with afterburner. 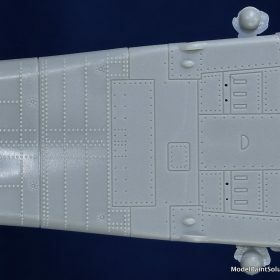 Hardpoints: 7 total: 2× wing-tip AAM launch rails, 4× under-wing & 1× under-fuselage pylon stations with a capacity of 7,000 pounds (3,200 kg). 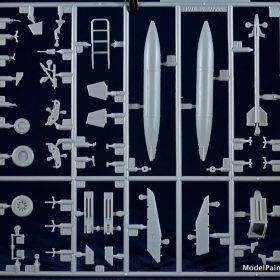 The kit comes in a lidded cardboard box adorned with box art depicting a Saequeh in flight with an Iranian F-14. 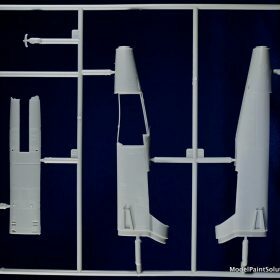 Inside are 8 individually bagged sprues of light grey styrene, the unattached upper fuselage halve, and one, small PE fret. The initial impression is one of complexity. There are a lot of parts (~190) in the box so a weekend build this is not. Close inspection of the parts reveals crisp moldings with little-to-no flash. The level of detail is high throughout the kit. 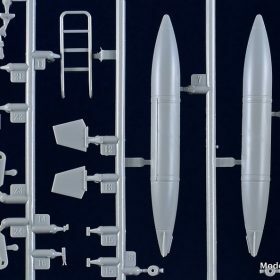 The surface details on the upper and lower fuselage halves are particularly nice and will look great under a wash.
Construction begins as usual with the cockpit and here AFV provides a nicely detailed, 5-part ejection seat and crisply molded left and right console pieces for the tub that will look more than adequate with a little careful detail painting. 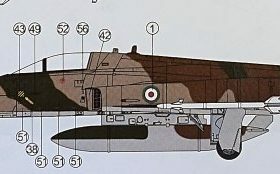 The assembled cockpit is captured between left and right forward fuselage halves and the open accesses on the left side of the nose are covered with appropriate panels. 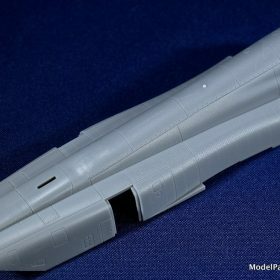 The addition of the nose cone completes the assembly of the forward fuselage. Should you wish to build your Saequeh with an open canopy, assembly of the multi-piece canopy hinge is next in sequence. 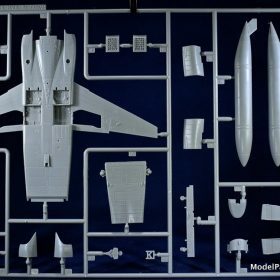 Joining of the upper and lower fuselage halves, which includes adding intake housings and splitter plates is next. 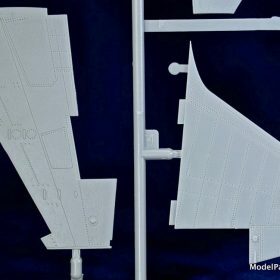 The addition of separate flaps, ailerons, leading edge slats, and horizontal stabilizer/elevator assemblies completes the aft fuselage, which is then combined with the front section (cockpit) completing the airframe. 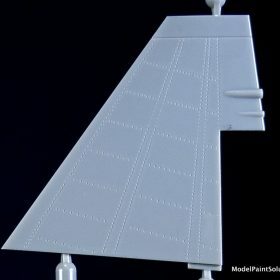 The real novel feature of the Saequeh—the twin vertical stabilizers—are each comprised of four parts. There are no slots or guides for their placement. 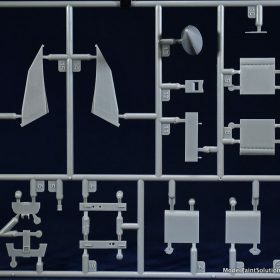 However, the instructions provide detailed schematics showing their placement relative to panel lines that run adjacent and in front of each stabilizer. Don’t let that description scare you. Gluing the stabilizers in place won’t be an issue if a little patience is exercised. 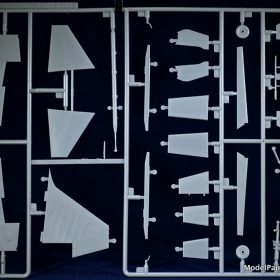 Assembly of the crisply molded landing gear is next followed by addition of underwing stores, gear doors, and air brakes, which are poseable open or closed. 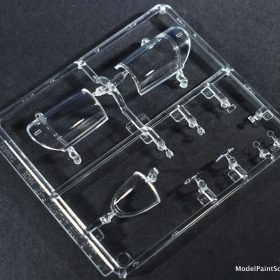 The clear parts are top quality: some of the best I’ve seen. 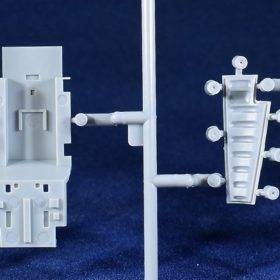 The clarity achieved by the folks at AFV is exceptional allowing the addition of the canopy without the usual buffing and dipping in Future: not needed with these parts. A nice addition to the canopy (closed or open) is a rear view mirror piece provided in photo-etch. 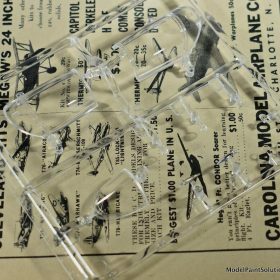 To invite the onlooker into the open cockpit, a detailed boarding ladder is provided: nice. 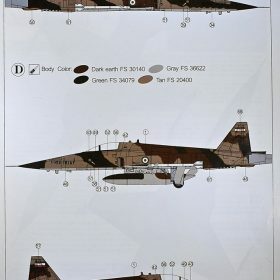 The decal sheet (printed in Italy for AFV Club) has good registration as well as appropriate colour and hue. The decals have very little carrier film. 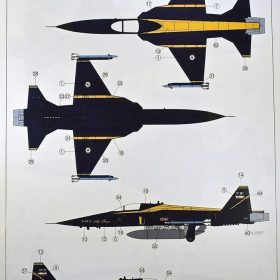 A smaller sheet has an additional set of yellow stripes for the airshow schemes. This is a very nice kit. 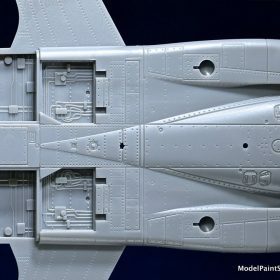 The surface details and inscribed panel lines on the fuselage and wings are excellent and will look very convincing under paint and washes. 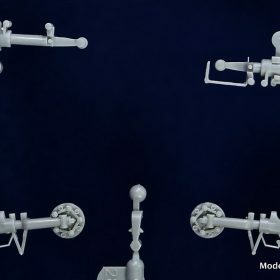 The canopy parts are crystal clear and poseable. 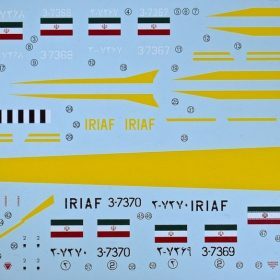 And, whether it’s the tri-colour desert camo or the Yellow/Blue airshow livery, the schemes covered by the quality decal sheet are both colorful and attractive and will make an already nice model a head-turner. Highly Recommended! Now go paint something! Kit provided for review.